Fabulously comfy Womens Black Lagenlook Tunic Top, New With Tags. Will be Dispatched with Royal Mail 2nd Class. It has a flattering scoop neckline and dip hem. It can be worn by a plus or regular size lady. It’s also very flattering on a taller frame! Made in Italy to a very high standard, the material is soft viscose with 5% elastane. Approx1 8. 5” from under arm to under arm. 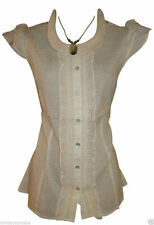 Ladies Kaliko Silk Top Size 12. Condition is New with tags. Dispatched with Royal Mail 2nd Class. Polyester sheer material in cream. V neckline with ties, cream buttons to front. pin-tucks, thin back ties, cap frilly sleeves. Phase eight Ladies Blue Soft 100% Cotton Chambray Casual Tunic Top UK 12. Front pleating gives a flattering shape. Dispatched with Royal Mail 1st Class. Beautiful navy and red floral shirt from Zara Basic. - Flattering fit - Size Small 8-10. Machine washable. 100% Viscose. - Cap sleeves. Seasalt Size 18 ‘Garden Gate’ green and white ladies top. Barely worn, has been worn less than ten times. Smoke free and pet free environment. mint velvet 14 top. Gray tones to cream in colour there is a gray vest inside attached Dispatched with Royal MailClass. Billie & Blossom Petite 12 Blouse. Pretty Floral Blouse, Never Worn. Dispatched with Royal Mail 2nd Class.